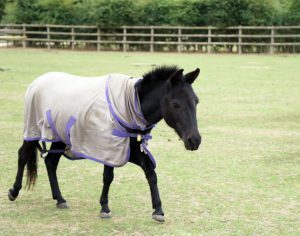 Ebony has been enjoying the warm weather and hasn’t needed her rug at all! Staff are still monitoring her weight as we head into spring and the grass starts to grow again. The dentist is also now monitoring her wobbly teeth to make sure she is comfortable and able to eat properly. Ebony was pleased to welcome her good friends Jemima and Matilda back to the field and enjoyed playing with them! With spring on the way staff have been carefully monitoring Ebony’s weight and have decided to decrease her feed as she was looking a little too well. The sunny and milder weather has meant that Ebony has enjoyed some time without her rug which she thoroughly enjoyed and celebrated with a good roll in the mud. Although the warmer weather also means it is getting closer to her sweet itch rug coming back out, which she will not be impressed with. Ebony is being very good and continuing her medication for Cushings, which she takes without any trouble when she eats her food. Ebony has been in a bit in the wars at the moment though, as when she saw the dentist on a routine visit, he discovered a loose tooth, so staff and the dentist will be monitoring her regularly. 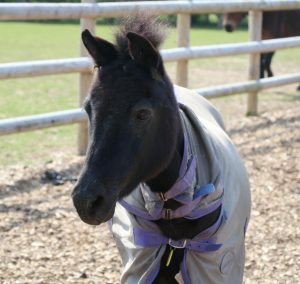 Ebony has recently had a blood test which showed she was positive for Cushings, so she is receiving medication to help her with this, and staff will be monitoring her for the next six months to make sure her management is correct. She has also had a microchip due to the recent change in legislation, and was very well behaved for the vet who, was very impressed there were no tricks played on them! Staff are very pleased with Ebony’s weight and condition so far this winter. She has moved to her winter paddock where there is some grass for them all to still enjoy, but they have had extra hay as well which is a real treat for her! She is still having breakfast but will soon start having tea to help maintain her weight. 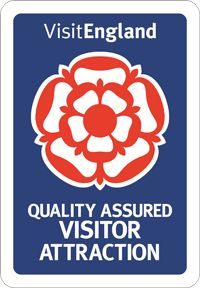 Staff think she will be very pleased about this and will take every opportunity to rub it in her friends faces! Ebony’s coat is getting lovely and thick for the Winter, but it still isn’t quite thick enough so she is having a thicker rug on to make sure she is warm enough at night and when it is raining. She is very happy about this and will often be at the gate on an evening waiting for staff to put her rug on. She is also very cheeky in a morning when she knows her breakfast is coming and makes a break away from her friends to meet the staff (with her breakfast), all so she can eat it in peace and all by herself. Ebony’s beautiful big thick coat is starting to come through and is keeping her extra warm at night now it’s getting a little cooler. The staff are monitoring her weight as she can sometimes lose a little in the winter. Ebony must know this somehow as she is the first to run into the pad in a morning to get her breakfast, making sure no one else gets her delicious food. 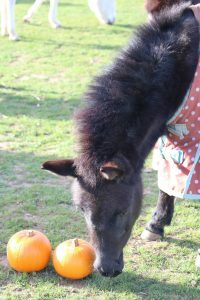 Although Ebony enjoys sharing treats with her friends, breakfast is a different matter! 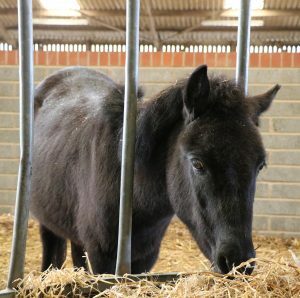 Ebony has had a few escapee Shetlands in her field this month when they made a bid for freedom from another field. Ebony didn’t take too kindly to this and quickly showed them the exit, although staff think she was a little jealous of their triumph, as Ebony is known for escape artist tricks herself! She now no longer wears her sweet itch rugs so she is making the most of it by having a good roll in the mud. 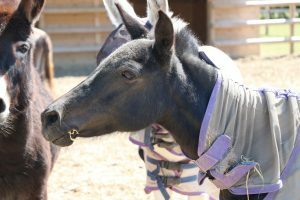 Ebony’s sweet itch is under control and she will continue to wear her fly rug and mask to help prevent it. Despite the staff’s best efforts to encourage the rain to come, it still hasn’t and the grass is becoming sparse. Staff are giving her extra feed stuffs and her condition is slowly picking up which staff are very pleased with. The staff are not as pleased with Ebony’s attempts at escaping the field lately, any gap is a challenge worthy of Ebony. 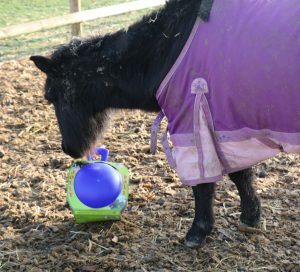 Ebony has dropped a little bit of condition and now has an extra feed to help with this, which she is very pleased with! Staff are also doing their best rain dance so the grass will grow a bit more to help her. 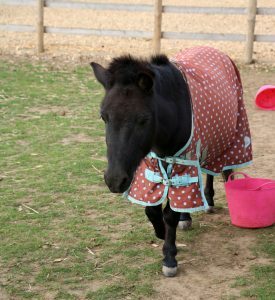 Thankfully though despite the warmer weather, Ebony’s sweet itch has not bothered her but she is still wearing her rug as prevention. Ebony has been feeling the love from her adoption fans this month as well as she has received two gifts and shared them with her friends. 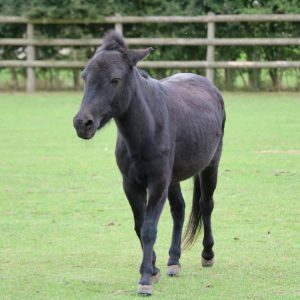 Ebony has also moved back to Visitor Centre to be reunited with her friends and adoption fans! She too is sporting a sweet itch rug just like her friend Nero. Ebony can become sore in the summer but she is having weekly treatments to help with this, the extra cuddles from the staff when she has her treatments is also going down very well with her! 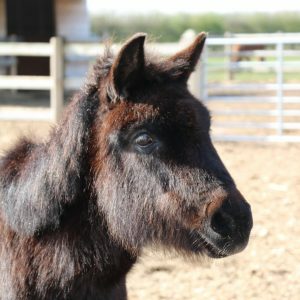 Ebony is still living at Walklands Farm along with some of the other donkeys but is hopefully soon set to move back to the Visitor Centre for the summer. 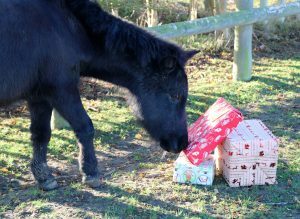 This hasn’t stopped her supporters showering her with presents of her favourite treats though! She has reluctantly shared them with her friends much to her disappointment. 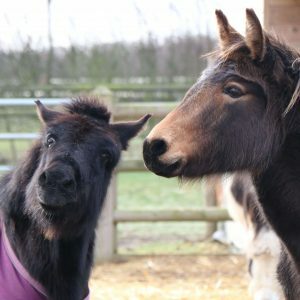 Ebony has been kept warm and dry throughout the snowy periods as she has also moved to Walklands Farm for the winter with some of the other donkeys. 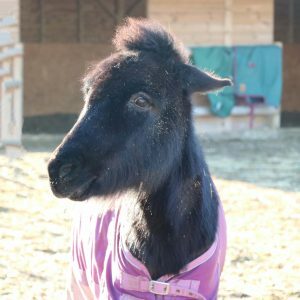 Ebony has been receiving additional food over the winter as she was starting to lose condition, however she has now improved condition and is no longer needing additional feed, much to her disappointment!